AICSYS Inc, produced the rugged design with industry-proven 2U rackmount chassis for RCK-203BA. 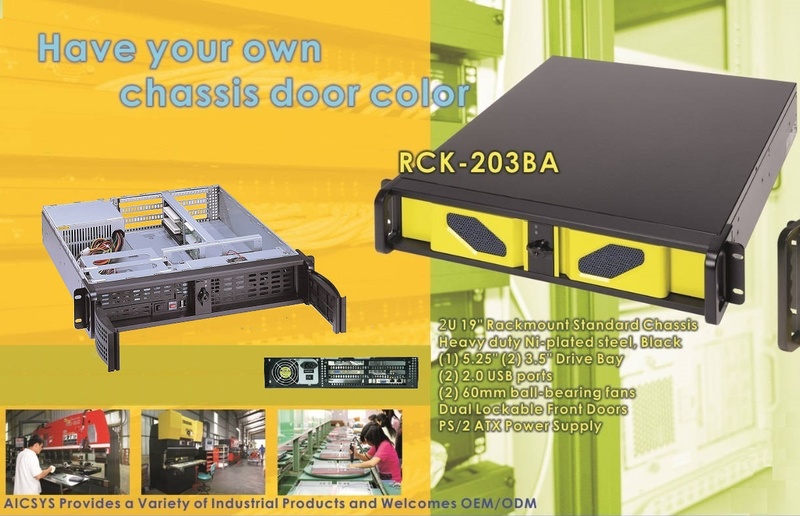 The RCK-203BA is a 2U 3 Driver bays rackmount chassis for sensitive application in harsh working condition with the classy design for colorful security door panel (optional). It is a prefect resourceful enclosure chassis for IPC solution you could find for your security network server, telecommunication, digit health care, intelligent video solution, IoT, power and Green IT energy solution. The RCK-203BA 2U Rack mount Chassis provides a classy and resourceful solution for a variety of Industrial applications using Full Size SBC through BP-0604P-2U, a (4) slot PICMG 1.0 and BPE-0501P-2U, a (5) slot PICMG 1.3 butterfly backplane. RCK-203BA offers (1) 5.25” and two 3.5” shock resistive drive bays. Two levels temperature management relies on (2) ball bearing 60mm fan that provide excellent cooling and System Environmental Monitor that warns users when the system temperature is above normal. One extra space for optional additional fan is provided for more heat sensitive application. RCK-203BA offers (2) 2.0 USB ports and supports standard PS/2 ATX Power Supplies. AICSYS Inc is the world leading IPC manufacturer based in Taiwan, with nearly twenty years of experiences in IPC marketing. We specialized in OEM/ODM service, provided by qualified design and technical team with our R&D department from basic design to a completed turnkey solution for your project. AICSYS accept reasonable small quantities OEM/ODM orders. Contact AICSYS Inc today, we have the answer you need.